As a group, coating professionals who deal mainly with industrial coatings generally focus on coating performance — the majority of concern being focusing on a coating’s ability to protect the substrate from the environment — and in the case of tank linings, to protect the tank contents from the substrate. Although these are certainly important considerations, another significant property of the coating is its ability to provide an aesthetically pleasing surface, particularly when the coated surfaces are visible to employees and/or the general public. Many companies and agencies use color for brand identity, so color retention becomes vitally important as well. For most of the population, the appearance of a coating is the most important consideration, since it is likely that the majority of the public is unaware of the consequences of the failure of a coating system to protect bridges, buildings and other structures. 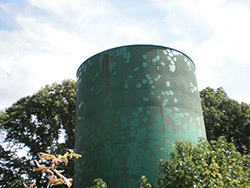 To the public, rust on a bridge or on the exterior of a nearby water tank is simply unattractive and they consider it an annoyance to pay taxes and quarterly water bills and still have to look at ugly rusted bridges and tanks. To illustrate this point, sometimes the outside of fascia girders of bridges are selectively coated while all the steel underneath the deck is left uncoated. In most cases, the amount of corrosion on the fascia girder is no greater than that on the rest of the girders. Coating of the fascia girders is performed simply to improve the appearance in areas that are visible to the public. One of the most common aesthetic problems encountered with protective coatings is color variation. Coatings are available in a myriad of different colors. Although an individual may find a particular color unappealing, as long as the color is consistent it is usually not considered to be an aesthetic problem. The problem occurs when either the applied coating has noticeable variation in color, or the color visibly changes sometime after application. Color can vary by batch, so using multiple batches of a topcoat on a single structure can result in aesthetic issues. The color of a coating is a function of the pigments that are added to the formulation. There are several different types of pigments, and the pigments that add color and opacity to a coating are referred to as prime pigments. A prime pigment can either be an inorganic mineral or an organic powder. For the most part, organic pigments tend to be brighter and more intense than the inorganic pigments. Unfortunately, the organic pigments do not generally have the opacity or the resistance to chemicals, heat and solar radiation (ultraviolet radiation from sunlight) that is usually found in the inorganic pigments. Because of the superior tinting ability of the inorganic pigments, they are often used to make brighter more intense colors. The perception of color is a visual phenomenon by which light strikes a material and different frequencies of light are absorbed by that material. As a result, the light that is not absorbed is reflected and the combination of frequencies of light are perceived by the eye as a color. Although color is perceived with the eye, it is difficult to quantify color using only the human eye. Fortunately, there are various ways of instrumentally measuring and quantifying color change. The color of a coating can be quantified by using a colorimeter. The colorimeter measures the spectral energy of light reflected from the coating over the visible spectrum. The instrument then assigns the resultant measurement standard color coordinates on what is known as a color space. There are various different color spaces, each having different coordinates for a color, but one of the most common is the L*a*b* color space. In that space, L* represents the darkness of the color on a scale of 0 to 100, with 0 representing the darkest black and 100 representing the brightest white. The a* and the b* coordinates represent the color and have numbers from -100 to 100, with positive a* representing red shades, negative a* representing green shades, positive b* representing yellow shades and negative b* representing blue shades. Color changes are quantified by measuring two colors and determining the difference between the colors in the color space using a common geometric equation to determine the distance between two points in space. It is held by many that a difference in color of 3 units (commonly known as ΔE* 3) or less is imperceptible to the average human. It is not uncommon for a specification addressing requirements for maximum color change to limit the color difference to ΔE* 3 or ΔE* 5. Severe chalking and erosion of an epoxy coating caused by degradation of the resin in ultraviolet light. The degradation resulted in both aesthetic and performance problems. When intense colors such as bright red or blue are chosen for a topcoat, it is not uncommon for aesthetic problems to ensue. There are a number of environmental factors that may affect the color, but one of the most common is exposure to both moisture and solar radiation. Usually, the colors chosen for topcoats are made by combining various tinting pigments. If one or more of the pigments fade upon exposure, the color of the coating can significantly change. With the example of fading under sunlight (UV) exposure, the fading becomes more noticeable because different areas of the coated surface fade at different rates based on the amount of UV light exposure. As a result, there are often significantly faded areas that are directly adjacent to areas of little or no fading, and the difference in color can be quite noticeable and aesthetically unpleasing. A classic case of color fading is the Hell Gate Bridge, a steel-through-arch railroad bridge located between Astoria in Queens, Randall’s and Ward’s Islands, and the Bronx. In the early 1990s, the bridge was completely recoated. The color selected for the topcoat was known as “Hell Gate Red,” a deep natural red. A four-coat system was employed consisting of two coats of epoxy, a pigmented polyurethane coat and a clear topcoat designed to preserve the red color of the bridge. The clear coat was designed to protect the underlying pigmented coat from the effects of sunlight but unfortunately, the bridge began to change color even before the repainting was completed. According to references, the paint supplier allegedly changed pigment suppliers prior to manufacturing the paint for the bridge. The contractor used the same paint to recoat the faded areas of the bridge in 1996. However, by 1999, the new paint had faded again. It appeared that the problems with color fading on the Hell Gate Bridge were caused by the use of a pigment that was not able to resist degradation by solar radiation over time. 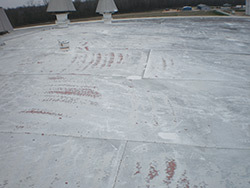 Further, the clear urethane topcoat was reportedly not formulated properly to protect the pigmented urethane undercoat. Similar color fading problems were encountered several years ago on multiple pedestrian bridges and associated railing structures coated with a royal blue waterborne acrylic finish coat or a polyurethane finish coat. The use of a clear coat over the acrylic polyurethane, a fluorourethane, and the use of a polysiloxane finish coat (in place of the traditional acrylic polyurethane) were given consideration. Ultimately a polysiloxane finish coat was selected. While polysiloxane and fluorourethane coatings are traditionally more costly than waterborne acrylic and polyurethane coatings, the savings in labor and material associated with a fourth (clear coat) application offset the higher cost finish coat. The aesthetics of a field touch-up can be compromised when the touch-up paint does not closely match the color of the weathered original coating. Exposure to ultraviolet light and moisture can also degrade the exposed resin on the surface of the coating, creating another type of aesthetic problem generally referred to as chalking. This is due to a property of light by which the light bends when it enters a material. Different materials bend the light at different rates. The refractive index of the material determines how much of the light is bent. This property is the reason why table salt appears to be white. If you look at an individual granule of salt under a microscope, it is transparent, not white. When light enters a pile of salt and it hits the first granule, it bends slightly and then bends again when it exits the granule back into the air space between the granules. It continues on into another granule and bends again. This process continues through multiple transparent granules of salt. Because the granules are aligned in different configurations, the bending of the light at the various angles causes the light to scatter, preventing the light from passing through the pile of salt. The eye sees all the different scattered light wavelengths and perceives the pile salt as white, not transparent. Essentially, the same phenomenon happens on the surface of a coating when a transparent resin degrades. Particles of the resin remain on the coated surface and scatter the light. The scattering of the light gives the coating a lighter (more white) appearance. Fading of pigments and deterioration of the resin on the surface of the coating give the coating a similar lighter appearance. It is often possible to distinguish between the two phenomena by rubbing oil on the surface. Oil will have a refractive index somewhat similar to the coating resin and greatly lessen the scattering of the light. If the oil causes the coating to darken significantly, the fading was a result of chalking. If not it was likely caused by pigment fading. Another common aesthetic problem is visible variations in gloss. Gloss is an optical property that determines how well a surface reflects light in a mirror-like fashion. Light is reflected from a perfect mirror in an equal and opposite angle of the incoming light and variations in sheen include flat, eggshell, satin, semi-gloss and gloss. Gloss is measured using a gloss meter which shines light on the surface at a predetermined angle of incidence (for example 20, 60 or 85 degrees) and then measures the amount of light that is reflected in the equal and opposite direction. On a microscopic level, gloss is usually determined by the relative amount of pigment that is protruding through the resin on the surface of the coating, as well as the grind of the pigment. Coatings with higher pigment content or a coarser grind of pigment generally have lower gloss. Yet other factors can affect gloss such as deterioration of the resin on the surface caused by exposure to the environment. This deterioration creates microscopic unevenness on the surface that causes the light to scatter. Similar to color, one of the biggest aesthetic problems with gloss is a variation in gloss across a coated surface. The most common aesthetic challenge in industrial coatings is matching both color- and gloss-intensive areas. This is most evident when a coating that has aged for several years is touched up. The aging process affects both the gloss and the color of the coating. If the original coating color is used during the touch-up, the touch-up paint is often a different color than the original because the original gloss and color have changed. If an attempt is made to match the color and gloss of the aged paint, it is not uncommon for the newly applied paint to then lose gloss and fade at a different rate than the original coating, making the touch-up paint visible after a few years of weathering. Hi Rick, very well done! I’d like to discuss several current coating application related topics with you that I am involved in at present in the Wood & Metals industried… they may be wirth writing about. Can you please contact me?